The circus has come to town - and so has the Doctor! Watching the parade pass by in 1832, he finds the people of Blandford strangely drawn towards the garish big top, and knows that something is terribly wrong. The only thing to do is pay a visit. Meanwhile Adam Farrow finds his sister caught up with the circus and its sinister ringmaster. What is behind Antonio's almost hypnotic power, and how is it connected with an event in the Doctor's future? Seized by clowns and forced into the centre of the ring, the Doctor encounters the fiercest of all circus acts. Yet something much more terrifying lurks in the wings - and the sound it makes is horribly familiar. Lives will be lost before the circus moves on - and the Doctor will face his own doom on the high wire. 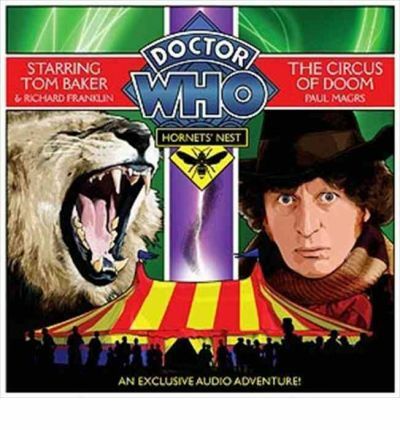 With Tom Baker as the Doctor, Richard Franklin as Mike Yates, Susie Riddell as Sally, Michael Maloney as Farrow, Jilly Bond as Francesca and Stephen Thorne as Antonio, "The Circus of Doom" is the third of five linked stories written by the acclaimed Paul Magrs. '...a cracking, mystifying and frankly weird tale' - "Chichester Observer". '...Baker delivers the drama and intensity that you recognise from the Forth Doctor of old' - "Doctor Who Magazine".